The average hallway is sort of like your last trip to the grocery store: not very exciting but you need to go through it to get to the good stuff... a great meal or in this case the back of the house! This long and bright hallway is the link between the front of the house and the children's wing in the back. 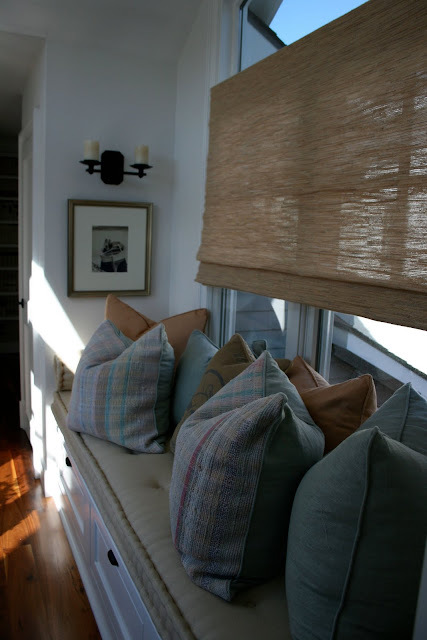 The banquette is sunny and warm most days and loaded with pillows made from my favorite vintage fabrics. 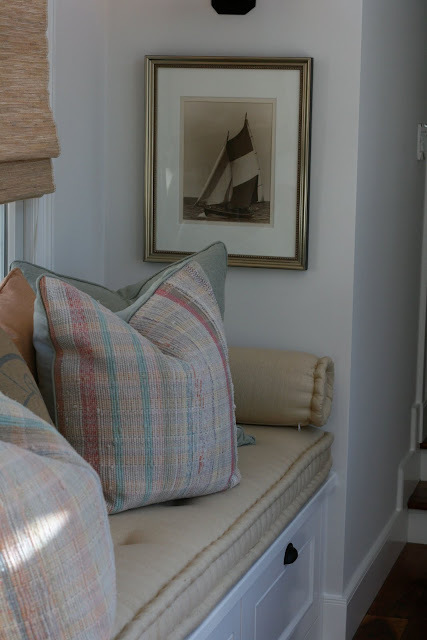 The solid fabric is raw silk (peach, sage and straw) and my upholsterer did a beautiful job with the hand sewn "scrunched" edging on the seat cushion and the bolsters. I am so in love with old rag rugs right now and find the colors really fun and different and they make GREAT pillows. 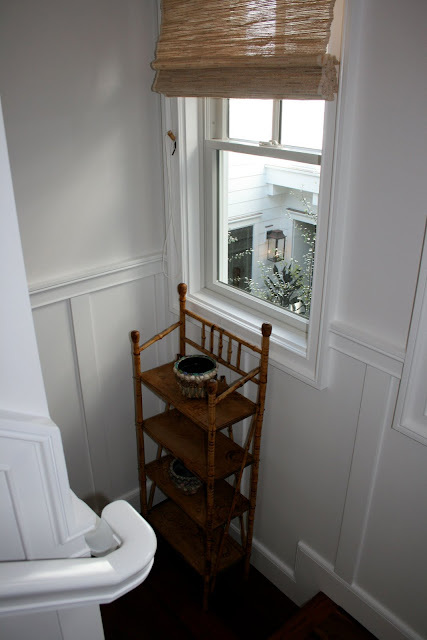 There is storage under the window seat for big bulky comforters and photo albums and nice little spots along each side for artwork. 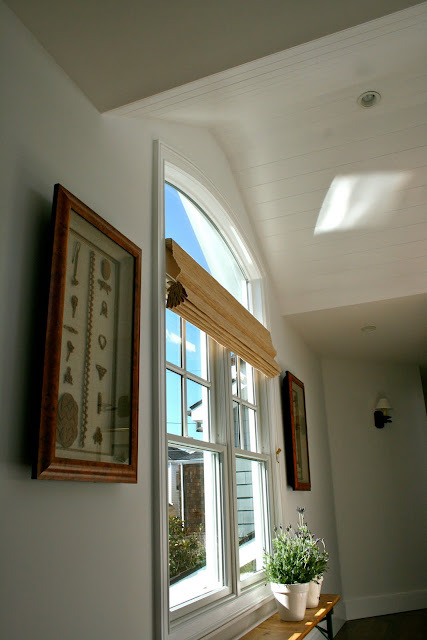 The arched windows lining the hall on either side add to the bright and sunny space and the high arched ceiling is crisp and fun in the fat bead board. 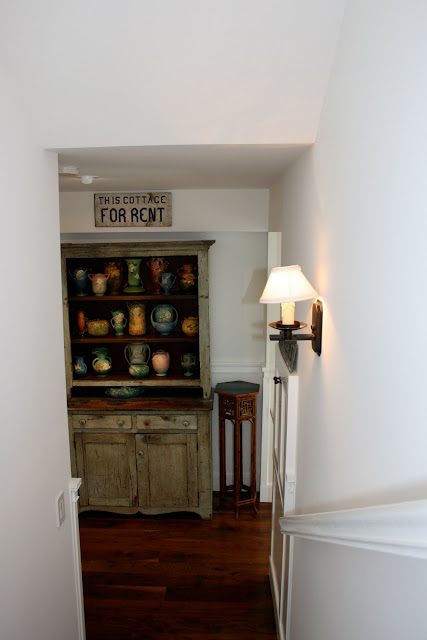 The height also helps to define this space as more than just a hallway. Suprise! This is actually a secret door that leads to the back wing but can closed off to keep the noise and privacy in check. I can't tell you how people LOVE this idea, especially children. It is thick and heavy ( about 4 inches in width) but closes gently with a spring action closure. I must admit this was not my design but that of the prior owner. I wanted to share it because it is such a GREAT IDEA. The hallway continues on to the back of the house and is pretty typical from this point on. Landings are usually small and really can't be used for much but what a great spot to showcase collections. I recently repainted the hand rails white (they were dark brown) to allow the stairs to feel more open and I removed all of the artwork. 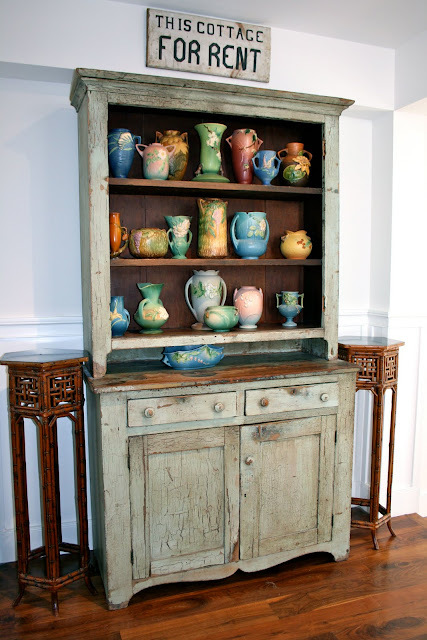 At the second floor landing I have a crusty painted cabinet with my collection of Roseville pottery. There is accent lighting on the ceiling and it helps to showcase the pottery. This spot happens to be favorite of my pal Millie. How can dogs sleep so much? Oops, I think I woke her up for her close-up. 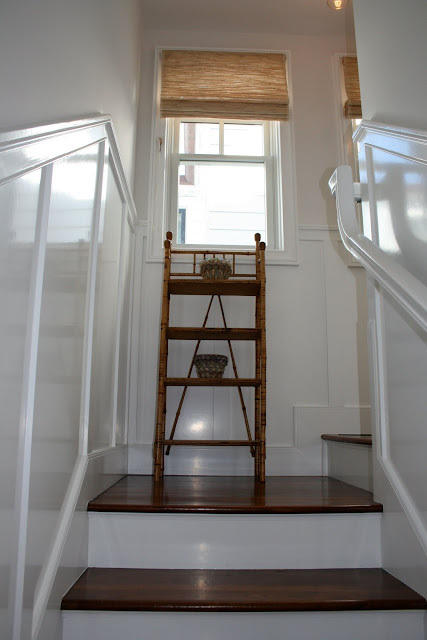 I really do like the little nooks and crannies of a house that are often overlooked and can be a source for inspiration and even a nice surprise now and then. Any thoughts? Would love to see your ideas too. 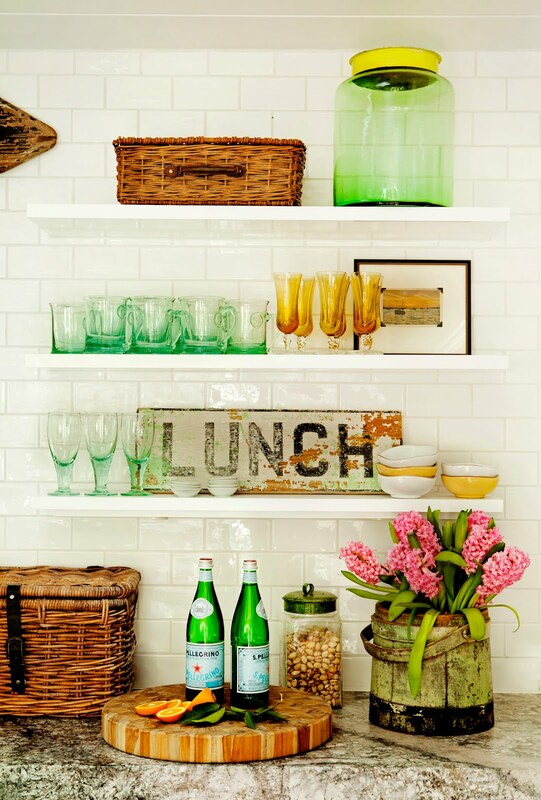 Please share your favorite secret decorating spot! Dogs are funny - they like to lie where you have to step over them! What great secret door!!! Really fun and great idea to turn a "bland interior door" into something special! As always... 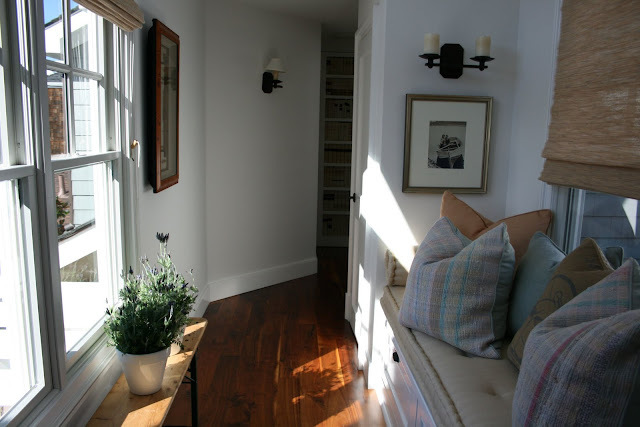 I enjoy looking in from Boston on your beautiful interiors! 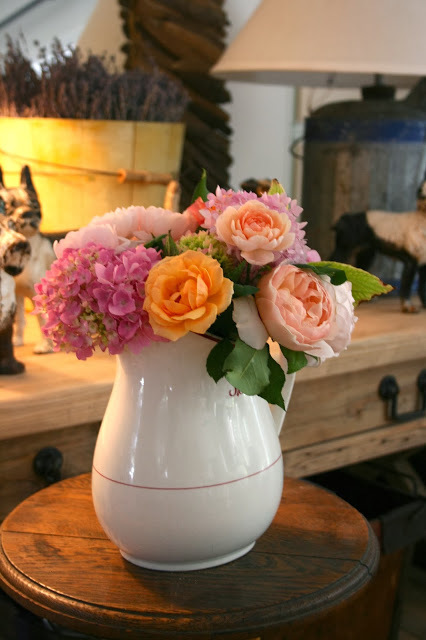 your home really is my favorite in blogland. i just love it so much. thanks for sharing! Oh Kelley, I SO love your style! 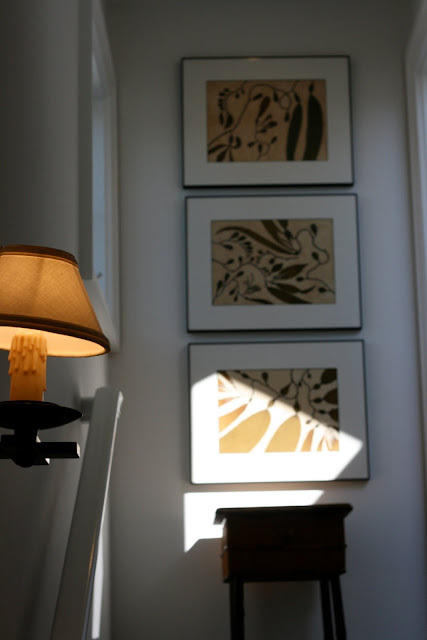 Your home is so warm feeling, yet uncluttered--a look that I find hard to pull off! You also have such great spaces to work with. Is your house fairly new construction or an older home? It's hard to tell with all the great detail. I also keep wondering--are you a professional designer? I'm guessing that you are. Thanks for continuing to share your wonderful home! 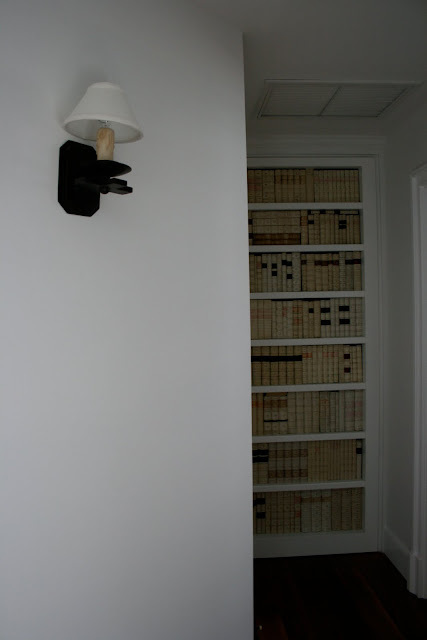 I really like the built in bookcase into the hallway, and the book spines are really nice. Glad you stopped by today. Love this post, especially Millie. 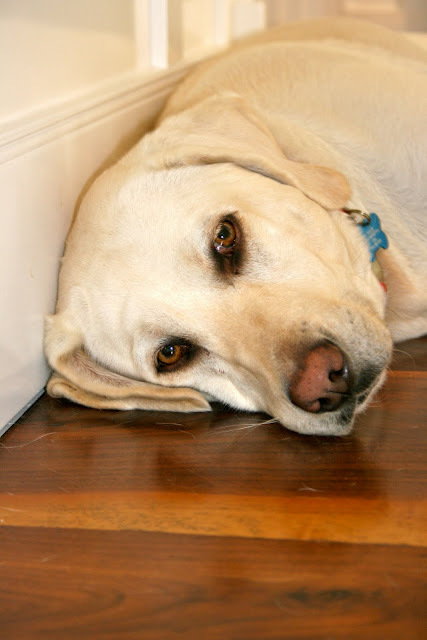 I'm currently 'dog-less'....wanting a white lab really bad! She's beautiful. What great ideas! You have a beautiful home! So Kelley.... When can I move in????? Love it all... I'm especially in love with the bamboo bookshelf & fat bead board. Those are my favorite design touches. Your house is gorgeous!!!! Thanks for sharing! Hi and thank you all for the really nice comments. I still can't believe anybody actually reads this blog! It is such an amazing world we are living in. But I read and enjoy every comment you leave and I always leave a comment when I have visited others as well. To Kelli, I have a small interior design business but my real passion of late has been in garden design, which I will be sharing more of this spring and summer. This house we are living in now is a "New/Old" house remodeled many times but essentially is finished at this point. When I sell a home I almost always sell all of the furnishings, including Antiques (sometimes I cry) but that is the nature of the design biz. 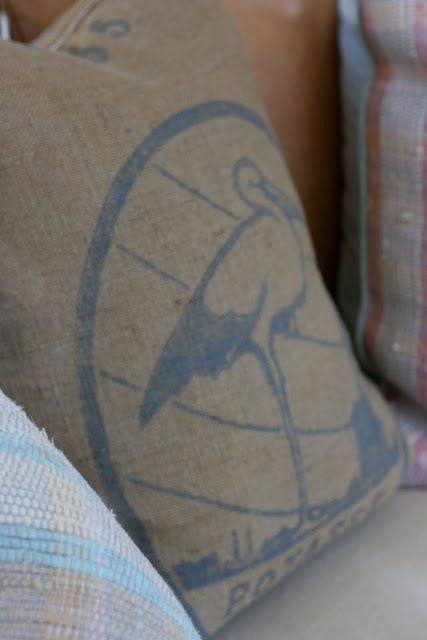 As usual, I LOVE, LOVE what you've done....what size piping did you use on the box cushion AND how do I specify to my workroom to create that particular type "pucker" in the piping/box? 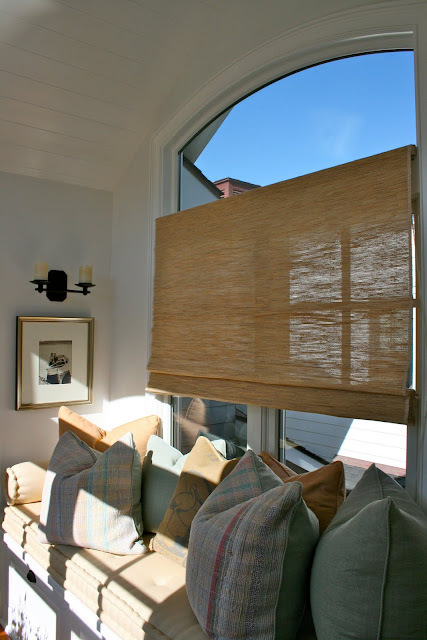 Would love to do this for my client's porch swing that's going into the Fish Camp (last blog)...I like it b/c it's like vintage ticking..
LOVE the faux book wall...how cool?! And your decorating is always classic....love Millie, she looks like a sweetheart! Can't wait to see your garden photos this spring/summer! Called in yesterday but didn't have time to leave a comment, so here I am back again. 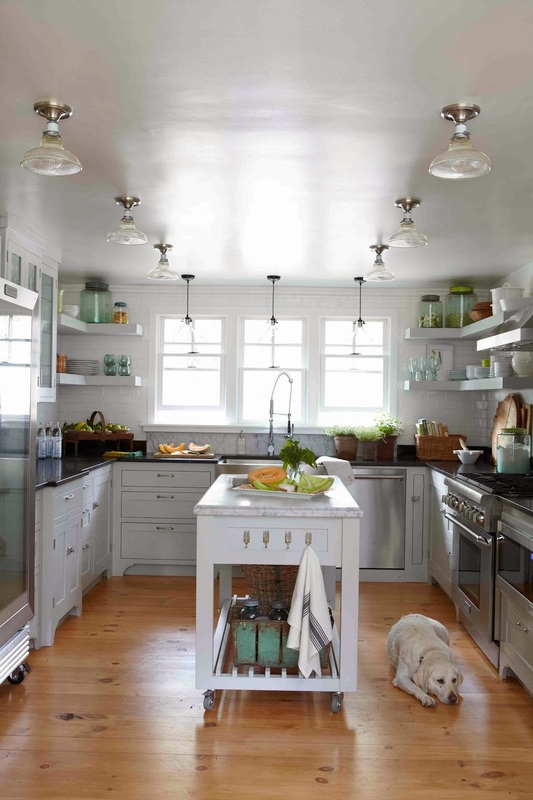 I can't tell you how glad I am that I found your blog 'cause I am seriously addicted to your home. Am crazy for all the pictures that you show, much appreciated, thanks for sharing with us. I also think passages are very underrated and after seeing yours I know I'm on the right track to include something like this if we ever build. 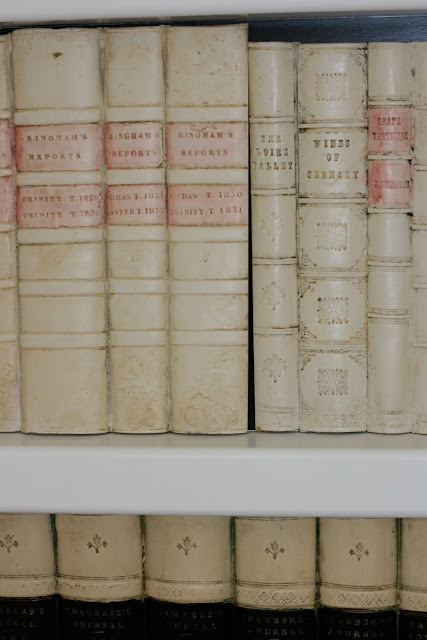 Love the bookshelf, with all of the gorgeous books, are those real??? 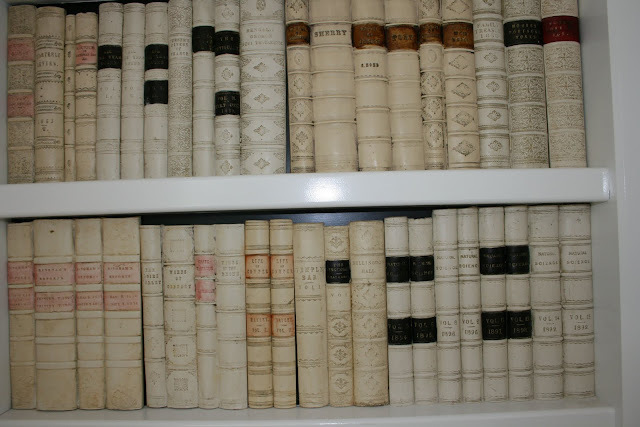 Did you paint the covers of the books to make them all like that??? 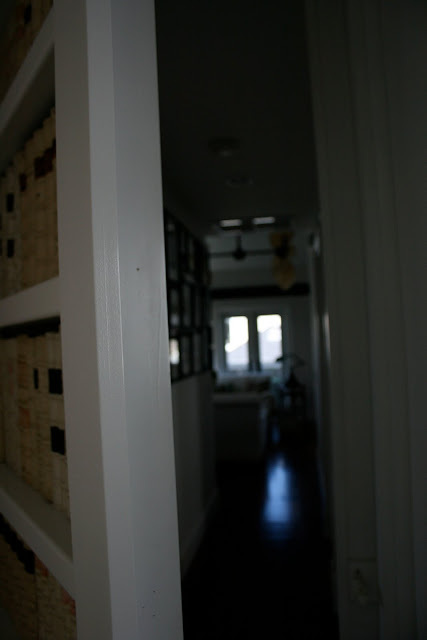 I showed my daughters the hidden passage behind the bookshelf and they really loved it to. I wondered if you were an interior designer and it doesn't surprise me that you are. I wish I had half of your talent.....it's all so beautiful. One question, when you are buying something for your home, or a clients, would you agree that scale is sometimes hard to get right or is there 'rules' that you go by. If you see something in a shop, do you wonder how it will look, with the scale and proportion or sometimes do you just 'wing' it? Just going by my humble observation, in a room where the proportion and scale are off, it seems to really kill a room. Or is it as obvious as using a tape measure? Anyway, I think I'm starting to ramble...it sounds like the garden design that you will show us this year will be great, but for my own personal drooling, I will never tire of seeing the interior of your home. Have a wonderful day. p.s. Doesn't it just blow you away that we are on the opposite sides of the world and technology has allowed all of us to connect like this...I think it's fantastic!!! I'm going now, no really....bye!! Hi Janine, thanks for stopping by again and I really enjoyed reading your comment. 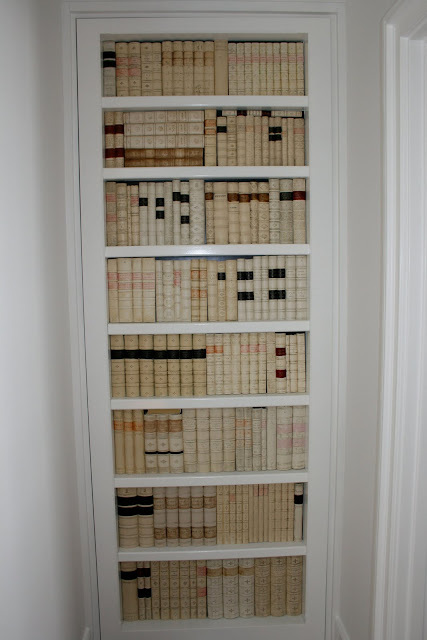 The books are not real but you could actually do this with real books, but it would make the door thicker. Re: scale, yes I find that a really important concept in everything even in the garden. Balance is the other key to a wonderful room. I must admit to making some really bad mistakes with scale. One that comes to mind is two chairs I designed and had made for the ends of a dining table. They ended up being sooo HUGE they looked like they were made for the Jolly Green Giant. The problem was that they made the other chairs seem really tiny. I need to do a post about some of my really bad mistakes, I think that would be funny! If I see something in a shop I always ask to take it home on "memo" to make sure it will work. If they wont let you do that, take a photo and go home and visualize the piece in the spot it is intended. Many times just waiting a day will make up my mind, I either have to have it or I'm sort of ho-hum about it and continue to look. 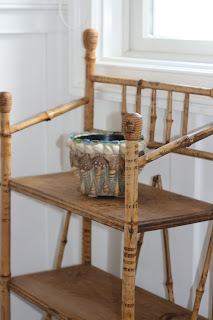 I just found your blog...you are so right in that are far too often neglected spaces! Yours look so inviting...love Millie! I enjoyed reading your comment and it really made my day that you took the time to reply and answer my questions, so thank you. Actually, it's really late here at night and I've taken a break from ironing, but I keep writing things and then deleting them 'cause none of this is sounding right and if I don't hurry up my iron will have melted! In essence, I think if you did do a posting on some 'mistakes' that you have made it would be great because it's not only great to see beautifully put together rooms where everything works but to read and/or see what doesn't work and equally learn what isn't a good idea to do in a room. And yes, I have started to bring things home to try out 'cause some things look so different when bought home from what they do in a shop. The other day I bit the bullet and bought home a mirror that I had been dreaming about for around 3 months, but when I bought it home it was bigger than it looked in the shop and didn't suit the room as much as I thought it would....hence to say it went back. Anyway, better go. Take care and will call in again soon. 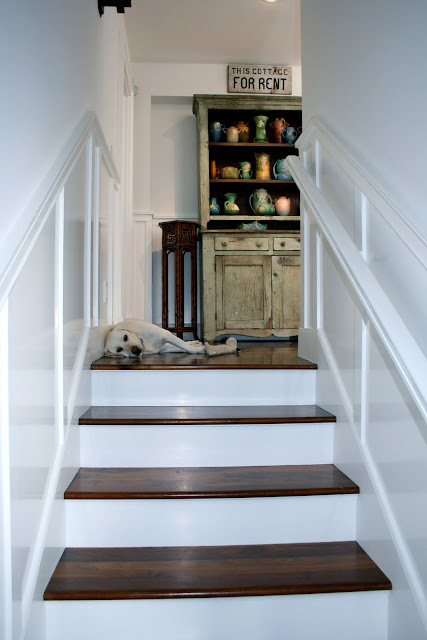 Okay...I have lots of thoughts about this post...your home is gorgeous...love, love, love the secret door...I would LOVE to have something like that...and Millie is absolutely adorable! Such a beautiful, warm home! Love your style! But, I have to say, nothing tops Millie's sweet picture! Keep posting with more great pictures of your home (& Millie). Hi guys: yes we do love our dogs don't we! Millie is soooo spoiled. Thanks again for all of the wonderful comments, I am SO glad you like the design and the fun details. Such a beautiful and bright area. Your home is lovely. The floors are gorgeous. I just found your fabulous blog! You really have such great style sense, your home is beautiful! 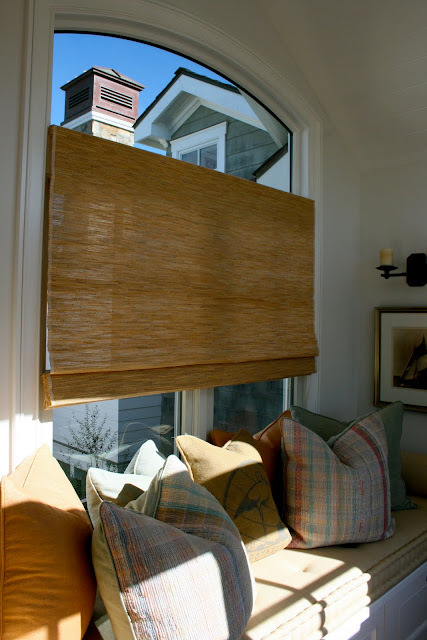 I have fallen in love with your blinds, can you share where you purchased these?